Note: Values of -9.0 in the tables indicate that data were not available for the particular year and category of waste treatment. 1940 Population served data from FWPCA (1970). Inventory of municipal wastewater facilities from NCWQ (1976). Data not available for no-discharge category; assumed zero for calculation of totals. 1950 Population served data and inventory of municipal wastewater facilities from USPHS (1951). Data not available for no-discharge category; assumed zero for calculation of totals. 1962 Population served data and inventory of municipal wastewater facilities from USEPA (1974). Data not available for no-discharge category; assumed zero for calculation of totals. 1968 Population served data and inventory of municipal wastewater facilities from USEPA (1974) and FWQA (1970). Data not available for no-discharge category; assumed zero for calculation of totals. 1972 Population served data from ASIWPCA (1984). Inventory of municipal wastewater facilities from USEPA (1972). Significant differences in population served data between USEPA (1972) (102.3 million) and ASIWPCA (1984) (76.3 million) for secondary treatment. USEPA (1972) includes population served by oxidation ponds (7.5 million, 4,467 facilities) and land application (0.5 million, 142 facilities) in the total population served of 102.3 million for "secondary" treatment. ASIWPCA (1984) reports 76.2 million served by secondary with no breakdown of categories of facilities given. To be consistent with trends in population served by secondary plants reported for 1968 (85.6 million) and 1978 (56.3 million), the popula tion served data from ASIWPCA (1984) is used to estimate wastewater flow, influent and effluent loading of BOD5 for 1972. 1973 Population served data and inventory of municipal wastewater facilities from USEPA (1974). Data not available for no-discharge category; assumed zero for calculation of totals. 1974 Inventory of municipal wastewater facilities from NCWQ (1976). Population served data not available for any category. 1976 Population served data and inventory of municipal wastewater facilities from USEPA (1976). Data not available for raw population served and effluent flow. Data not available for no-discharge category; assumed zero for calculation of totals. 1978 Population served data, inventory of municipal wastewater facilities, wastewater effluent flow (as 1,000 m3/day), influent and effluent BOD5 loading data from USEPA (1978). 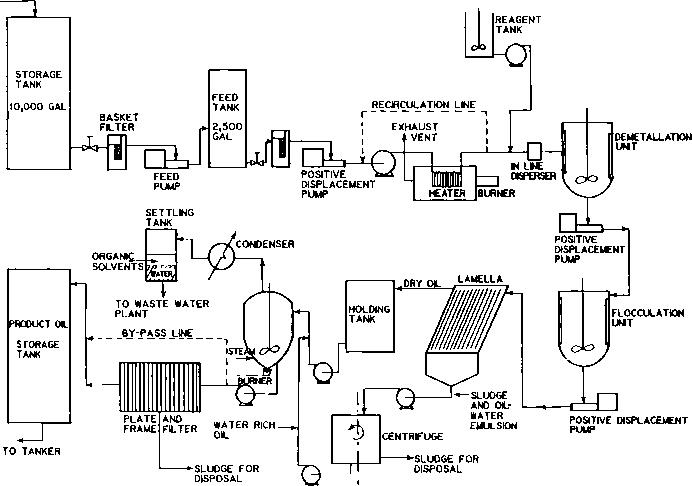 Effluent flow from USEPA (1978) converted from 1,000 m3/day to mgd using conversion factor of 0.2642. Population served by raw discharge reported as 364,000 persons in Table 10 of the USEPA (1978) Needs Survey. To be consistent with trends in population served by raw discharge for data reported for 1968 (10.1 million), 1972 (4.9 million), 1980 (2.3 million), and 1982 (1.9 million), the value for 1978 given in Table 10 appears to be in error by factor of 10. The population served by raw discharge for 1978 is increased by a factor of 10 to 3.64 million for this study. Data reported in USEPA (1978) for effluent flow, influent and effluent BOD5 loading for raw discharge, computed from erroneous population served data, is not used. The number of facilities reported in USEPA (1978) as raw discharge systems (n = 91) is not consistent with trend of 2,265 raw facilities reported for 1972 and 237 raw facilities reported for 1982. There is a possible factor of 10 error in USEPA Needs Survey data table since n = 910 raw facilities would be consistent with the decreasing trend in the number of raw facilities from 1972 to 1982. 1980 Population served data, inventory of municipal wastewater facilities, wastewater effluent flow (as 1,000 m3/day), influent and effluent BOD5 loading data, and percent BOD5 removal from USEPA (1980). Effluent flow from USEPA (1980) converted from 1,000 m3/day to mgd by conversion factor of 0.2642. Data not available for raw effluent flow. 1982 Population served data, inventory of municipal wastewater facilities, wastewater effluent flow (as 1,000 m3/day), influent and effluent BOD5 loading data, and percent BOD5 removal from USEPA (1982). Effluent flow from USEPA (1982) converted from 1,000 m3/day to mgd by conversion factor of 0.2642. Data not available for raw effluent flow. 1984 Population served data, inventory of municipal wastewater facilities, wastewater effluent flow (as mgd), influent and effluent BOD5 loading data, and percent BOD5 removal from USEPA (1984). Data not available for raw effluent flow. 1986 Population served data, inventory of municipal wastewater facilities, wastewater effluent flow (as mgd), influent and effluent BOD5 loading data, and percent BOD5 removal from USEPA (1986). Data not available for raw effluent flow. 1988 Population served data and inventory of municipal wastewater facilities from USEPA (1989). 1992 Population served data and inventory of municipal wastewater facilities from USEPA (1993). 1996 Population served data and inventory of municipal wastewater facilities from USEPA (1997). 2016 Projection of population served and inventory of municipal wastewater facilities for the year 2016 from USEPA (1997). Data Sources The primary data sources for the analysis of POTW wastewater trends included the municipal wastewater inventories published by the USPHS from 1940 through 1968 (USPHS, 1951; NCWQ, 1976; USEPA, 1974) and USEPA's Clean Water Needs Surveys (CWNS) conducted from 1973 through 1996 (USEPA, 1976, 1978, 1980, 1982, 1984, 1986, 1989, 1993, 1997). Each data source reported the number of municipal wastewater treatment plants and the population served by raw, primary, advanced primary, secondary, advanced secondary and advanced treatment levels of wastewater treatment. Where data were available to differentiate primary from advanced primary and advanced secondary from advanced treatment, the data were added to define "less than secondary" and "greater than secondary" categories. For some of the USEPA Needs Surveys, facility inventories and population served data were compiled as "less than secondary" and "better than secondary"; data were not available to differentiate primary and advanced primary or advanced secondary and advanced treatment levels of wastewater treatment. The USEPA Clean Water Needs Surveys also compiled effluent flow, influent and effluent loading and percent removal of BOD5 in the reports for 1978, 1980, 1982, 1984 and 1986. For the years in which these data were not available, wastewater effluent flow, influent and effluent BOD5, CBODu, TKN, NBOD, BODu, TSS, and POC loading data were estimated based on: (1) population served; (2)constant normalized flow rate of 165 gallons per capita per day (gpcd); (3) influent BOD5 of 215 mg/L and effluent BOD5 removal efficiencies; (4) effluent ratios of CBODu/ BOD5; (5) influent TKN of 30.3 mg/L and effluent TKN removal efficiencies; (6) influent TSS of 215 mg/L and effluent TSS removal efficiencies; and (7) effluent ratios of the particulate organic fraction of TSS and a constant ratio of carbon to dry weight (C/DW). States average (165 gpcd) within the wide range (65 to 290 gpcd) of municipal water use that accounts for residential, commercial and industrial, and public water uses in the United States (see Metcalf and Eddy, 1991). Public wastewater flow, obviously related to public water withdrawals, can range from 70 to 130 percent of the rate of water withdrawal, with a reasonable assumption being that wastewater flow is approximately equal to withdrawals by water supplies (Steel, 1960). Influent BOD5 The influent BOD5 concentration of 215 mg/L, consistent with many other estimates of raw wastewater strength (e.g., AMSA, 1997; Tetra Tech, 1999; Metcalf and Eddy, 1991), is based on the mean (n = 5) nationally aggregated ratio of the total influent BOD5 loading rate normalized to total wastewater flow reported in the USEPA Clean Waiter Needs Surveys for 1978 through 1986 (see Table B-9). The influent concentration, ranging from 209 to 229 mg/L for these years, includes the residential, commercial and industrial, and infiltration and inflow contributions to the total influent BOD5 load to municipal wastewater treatment plants. Using the influent BOD5 concentration of 215 mg/L and the normalized flow rate of 165 gpcd, the normalized influent BOD5 loading rate (0.296 lb BOD5 per person per day) accounts for the nationally aggregated mixture of domestic, commercial and industrial, and infiltration and inflow components of wastewater. The loading rate used in this analysis is almost a factor of two greater than the typical textbook value for the "population equivalent" (PE) of 1 PE = 0.17 lb BOD5 per person per day. Typical textbook values account only for the average per capita residential load contributed by combined stormwater and domestic wastewater; the industrial and commercial component is not included (Fair et al., 1971). Effluent BOD5 The effluent BOD5 loading rates, estimated using removal efficiencies typically assigned for NPDES permit limits and wastewater treatment plant design assumptions, are based on an influent concentration of 215 mg/L and removal efficiencies (as percentage) assigned to each level of treatment. The BOD5 removal efficiencies assumed for primary (35 percent), advanced primary (50 percent), and less than secondary (42.5 percent), although somewhat lower than removal efficiencies reported for primary (41 percent), advanced primary (64 percent), and less than secondary (54 to 57 percent) based on PCS data compiled for the USEPA Clean Water Needs Surveys for 1976, 1978, and 1982, are consistent with typical textbook values reported for BOD5 removal efficiency for primary treatment plants (see Met-calf and Eddy, 1991). used to define these treatment categories in the USEPA Clean Water Needs Survey for 1978 (USEPA, 1978). Secondary treatment was defined in the 1978 Needs Survey by a BOD5 effluent concentration of 30 mg/L with the removal efficiency ranging from 84 to 89 percent (USEPA, 1978). Advanced secondary was defined by an effluent BOD5 range of 10 to 30 mg/L, and advanced waste treatment was defined by an effluent BOD5 concentration less than, or equal to, 10 mg/L (USEPA, 1978). Assuming a mean influent concentration of 215 mg/L, a midrange effluent concentration of 20 mg/L for advanced secondary, and 10 mg/L for advanced waste treatment, BOD5 removal efficiencies were assigned as 90 percent for advanced secondary and 95 percent for advanced waste treatment. Ultimate BOD Influent and effluent loading rates of the ultimate carbonaceous BOD (CBODu) were estimated from the BOD5 loads and conversion ratios of ultimate to 5-day BOD (CBODu/CBOD5) defined for each level of municipal treatment (Leo et al., 1984; Thomann and Mueller, 1987). Since it is impossible to determine if historical BOD5 effluent loads included the suppression of nitrification (see Hall and Foxen, 1984), it is assumed that BOD5 is approximately equal to CBOD5 (see Lung, 1998). Loading rates for the nitrogenous component of oxygen demand (NBOD) are estimated from the influent concentration and removal efficiencies of oxidizable nitrogen (TKN) for each level of treatment and the oxygen/nitrogen ratio of 4.57 g O2 per g N. Removal efficiencies for TKN are based on data compiled by: (1) Gunnerson et al. (1982) for primary (22 percent); (2) advanced primary (22 percent) assumed the same as primary, and (3) secondary (36 percent). TKN removal efficiencies assigned for (4) advanced secondary (78 percent); and (5) advanced treatment (83 percent) are within the twenty-fifth and seventy-fifth percentile ranges of data compiled for advanced secondary (72 to 92 percent) and advanced treatment (79 to 95 percent) from AMSA (1997). Less than secondary removal efficiencies are assigned as the mean of primary and advanced primary removal percentages. Better than secondary removal efficiencies are assigned as the mean of advanced secondary and advanced treatment removal percentages. The total ultimate BOD (BODu) load is calculated as the sum of the ultimate carbonaceous (CBODu) and nitrogenous (NBOD) components of the effluent load of oxygen demanding substances . Table B-31 summarizes the influent and effluent concentrations and removal efficiencies assumed for calculation of the loads of BOD5, CBODu, TKN, NBOD, and BODu. Projection of Effluent Load Trends from 1996-2050 Projections of effluent loading trends for ultimate BOD are based on: (1) U.S. Census Bureau "middle" population projections from 1996-2050 (U.S. Census, 1996); (2) constant wastewater inflow rate of 165 gpcd; (3) constant BODu influent concentration of 396.5 mg/L; and (4) linear extrapolations of the percentage of projected population served by POTWs and removal efficiencies for BOD5, CBODu, NBOD, and BODu estimated for 1996 and 2016 using data obtained from the 1996 Clean Water Needs Survey (USEPA, 1997). It is assumed that the design BODu removal efficiency (65 percent in 1996 and 71 percent in 2016) and the proportion of the United States population served by POTWs (72 percent in 1996 and 88 percent in 2016) increases linearly from 1996 to 2016. After 2016, it is assumed that these percentages remain constant over time from 2016 to 2050 as 71 percent removal efficiency for BODu and 88 percent of the projected population served by POTWs. Influent TSS and POC The influent TSS concentration of 215 mg/L, consistent with other estimates of raw wastewater strength (e.g., Tetra Tech, 1999; Metcalf and Eddy, 1991), is based on the mean influent concentration from 60 wastewater facilities reported in AMSA (1997). The influent concentration of POC (70.95 mg/L) was estimated from the particulate organic matter (POM) (volatile suspended solids) fraction of influent TSS (POM/TSS = 0.75) for "medium" strength raw wastewater and a C DW ratio of 0.44 mg C/mg DW (Metcalf and Eddy, 1991). Effluent TSS and POC Removal efficiencies for TSS are based on data compiled by: (1) Gunnerson et al. (1982) for primary (50 percent); (2) NRC (1993) for advanced primary (70 percent); and mean removal efficiencies computed from data reported by AMSA (1997) for (3) secondary (92 percent); (4) advanced secondary (97 percent); and (5) advanced treatment (98 percent). Less than secondary removal efficiencies are assigned as the mean of primary and advanced primary removal percentages. Better than secondary removal efficiencies are assigned as the mean of advanced secondary and advanced treatment removal percentages. Effluent concentrations of POC are estimated from particulate organic matter (volatile suspended solids) fractions of TSS for primary and advanced primary (0.83), secondary and advanced secondary (0.67) obtained from Clark et al.(1977). Data were not available to define the organic matter fraction of TSS for effluent from advanced treatment; a value of 0.5 was assumed as a reasonable characterization of the organic matter fraction of effluent TSS. The organic component of effluent TSS was converted to POC using a constant C/DW ratio of 0.44 mg C/mg DW (Metcalf and Eddy, 1991). Table B-32 summarizes the influent and effluent concentrations and removal efficiencies assumed for calculation of the loads of TSS and POC.